Become a member of Sammamish Rowing and join a diverse community of over 1,000 passionate rowers. Parking is in the gravel lot on the east side of W. Lake Sammamish Parkway three-quarters of a mile south of the main entrance to Marymoor Park. For a map of the exact location, click here. Enter the parking lot at the south entrance and exit the parking lot at the north exit. Only turn right out of the north exit (see picture below). Because we are within Marymoor Park, you must pay $1/day at the box near the middle of the lot, or purchase a Marymoor Parking Pass here. 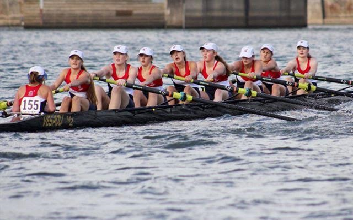 USRowing Waiver: Club Code: FTA9E​ The USRowing Waiver and Basic Membership ($9.75) must be completed online by all rowers. Any rower participating in a USRowing Regatta (Regionals/Nationals) must also have a Championship Membership. ​USRowing Safety Video: Must be watched by all rowers annually and is often completed during the first class session. ​Float Test: Must be completed in order to participate in any program or team at SRA (excluding Row for a Day). Float tests expire every 5 years. ​Code of Conduct: Must be completed by all competitive junior team rowers annually. ​Travel Permission Slip: Must be completed by all competitive junior team rowers annually. ​IRC Safety Quiz: Must be completed annually by​ all Independent Rowing Card holders including individuals with private boats.